A diagnosis of myeloma is reached after a number of measurements and techniques which together present a picture of what is happening in your body. Many of these will be repeated regularly to monitor the progress of the myeloma. The diagnostic tests developed recently enable the doctors to diagnose and treat myeloma at an earlier stage than has previously being possible; i.e. before it has caused complications. These focus on measuring the level of blood cells and the amount of abnormal protein (paraprotein) and other substances in blood and/or urine. A full blood count measures the amount of the various types of cells in the blood. Red blood cells are responsible for carrying oxygen around the body; a low level relative to the normal range indicates anaemia, which can make you feel tired and lacking in energy. White blood cells are responsible for fighting infection, so a relatively low level means you may be at increased risk of infection. A low level of blood platelets, the third main type, increases the risk of bruising or bleeding. As well as measuring the blood cells, diagnostic tests will also measure the concentration of protein, waste products and calcium in the blood. The amount of albumin, the main protein in the blood, is lower than normal in people with myeloma, and the amount of beta-2 microglobulin (ß2M) is higher; this is a key indicator of myeloma. The presence of paraprotein, which is not normally present, is indicative of myeloma and can be measured in the blood or urine. Calcium levels in the blood are higher than normal in people with active myeloma, as calcium is released from the bone. Urea and creatinine, which are waste products normally removed from the blood by the kidneys, may reach higher levels in the blood if the kidneys are not functioning fully. Further information about paraprotein can be gained by measurement of the relative amounts of specific parts of the paraprotein structure in the blood – the free light chains. Paraprotein can have one of two types of light chains, known as kappa (κ) or lambda (λ). The total amount of light chains is higher than normal in myeloma, and the ratio between the two types is different. This test can also be done if myeloma is suspected but no paraprotein can be detected. It is also particularly useful for detecting light chain myeloma or non-secretory myeloma. It is important that your doctors have a clear picture of any effects the myeloma may have had on your bones, so part of the diagnostic procedure will be to use one or more imaging techniques in a skeletal survey. This is a series of X-rays of your spine, skull, upper legs and upper arms, and will show any areas affected by myeloma bone disease. Any areas where the bone has been damaged can then be repaired. More information can be obtained from other types of imaging techniques. A CT scan (computerised tomography, sometimes called a CAT scan), is one in which a series of X-ray pictures are combined by computer to build up a detailed picture of particular areas of the body. Sometimes a dye is injected into a vein to help distinguish the different organs. 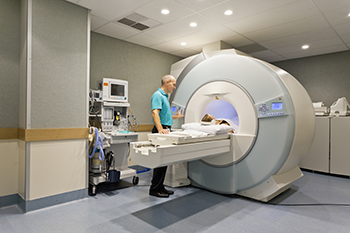 MRI (magnetic resonance imaging) uses radio waves instead of X-rays, and the radio waves passing through the body are converted by computer into cross-sectional pictures. 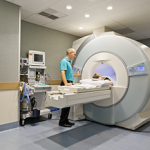 MRI scans are useful for locating any abnormalities that are not shown up by X-rays. A PET scan (positron emission tomography) detects plasmacytomas. A small amount of radioactive glucose is injected, and this tends to concentrate in the areas where the cells are using the most energy, which is where the abnormal cells have collected. The PET scanner then detects these areas. PET scans can be integrated with CT scans and conducted at the same time, giving a more complete picture than either method can alone. Bone marrow tests are carried out to find out whether abnormal plasma cells are present in the bone marrow, and in what proportion to normal plasma cells. Samples are taken from the liquid of the bone marrow (bone marrow aspiration) and the solid part (bone marrow biopsy). Both are usually taken by needle from the hip bone, under local anaesthetic. The samples are examined under the microscope by a pathologist, who is trained in evaluating cells and tissues. Normal bone marrow contains less than 5% of (normal) plasma cells. Myeloma patients may have between 10-90% of abnormal plasma cells. Another type of bone marrow testing to assist in the diagnosis of myeloma is recommended in recently updated guidelines from the International Myeloma Working Group of the International Myeloma Foundation.This is called FISH testing (fluorescence in situ hybridisation). The test is carried out on a small part of the same bone marrow sample as the biopsy. It is able to identify specific genetic abnormalities in the DNA of plasma cells which were formed when the cells were developing. These genetic changes (mutations) occur spontaneously and the type of mutation indicates whether the myeloma should be treated as standard risk or high risk. 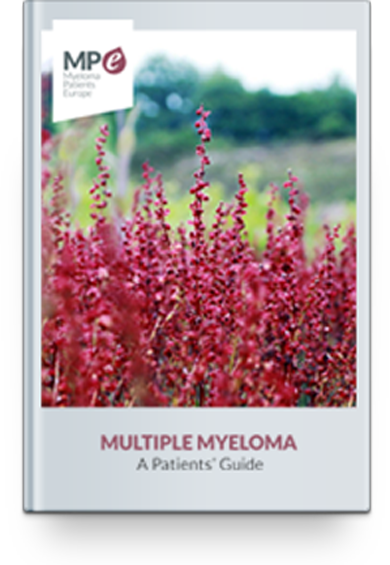 There is no single test which determines whether or not you have myeloma. Instead, the team of haematologists, radiologists, nurse specialists and others will assess the results of the tests described above, and decide if you have myeloma, what type it is and how far advanced. Myeloma is a complex disease, needing input from many medical specialists, so other consultants, like orthopaedic (bones) or renal (kidney) specialists may be involved, depending on your individual needs. The test results enable the doctors to find out where the myeloma is in the body and how far it has developed already – known as its stage. Once this is established, decisions can be made on what treatment is needed. For every different measurement made on your blood, bone marrow or urine, there is a range of values which would be expected in people who do not have myeloma. You may prefer not to know how your own test results compare with these normal ranges. However, many people do find that as their treatment progresses, it can be encouraging to see how their test results are improving with treatment.